While most of my Canadian friends who have been to Spain have either been to Madrid or Barcelona – I have been to neither. My time last summer was spent exclusively in The Spaniard’s province of Cantabria; however, over the recent holiday season I had a chance to head west and do some day tripping in Asturias. Asturias is known for it’s rugged coastline and mountains, which made for a beautiful drive. Our first stop in the morning was to Gijón, the largest city in the province. The unseasonably warm weather made for a lovely walk along the water and around town. Asturias is known for growing apples which are turned into cider (sidra), which is famously poured from above the head. Bottled without gas, Asturian sidra is served using this long vertical pour to help it aerate when it splashes into the glass. When we sat down to try a bottle – they offered us the ‘foreigner friendly’ table-top version. While pressing the button on the back of the figurine’s back was entertaining, The Spaniard asked if they could pour it the traditional way (and watch how much of it hits the floor rather than the glass). Our aperitivo included another local dish – chorizo in sidra. Back on our city walk – I was impressed by the recycled sidra bottle Christmas tree. However – I was very confused by this guy. He looked fuzzy and I would have loved to touch him – but he was protected from me by his cross, shield, and white picket fence. Next, we set off to Llanera so we could try La Corriquera, a Michelin Guide Bib Gourmand rated restaurant, for lunch. The menu of the day offered a four-course menu for 25 euro including wine and water (I thought it was a bargain!) Of course, I felt the pork dish (Asado Asturcelta al Horno) was the best. And of course – we were both excited about the dessert. 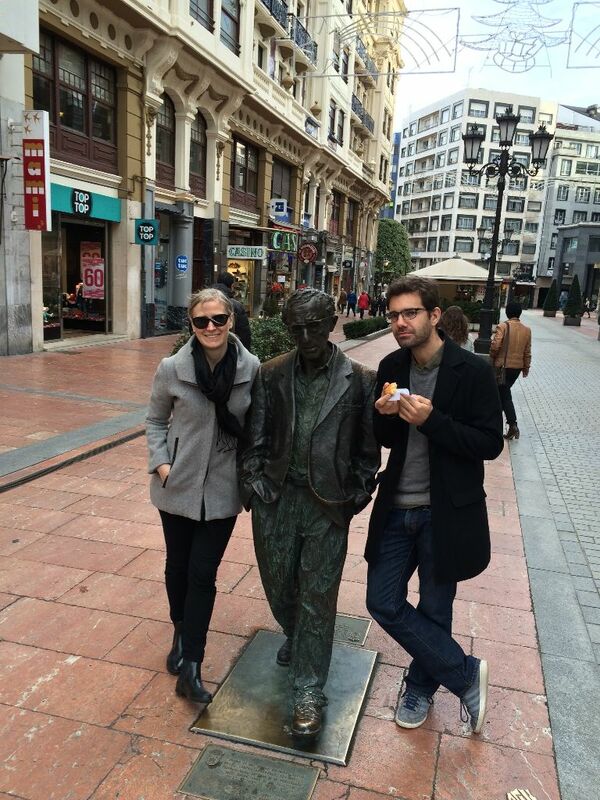 We arrived in Oviedo to stay at the home of The Spaniard’s godfather Manolo, his wife Mari-Luz, and their son Manuel. Asturias is known as the land of cheese – and the samples at dinner that evening did not disappoint. The next day Mari-Luz and Manuel took us a tour of Oviedo. A mountain view of the city gave us a good look at the Calatrava designed mall/hotel. Apparently the structure is an eye-sore to many locals, but I found the Star-Trek design very entertaining. The Spaniard was very interested in structure from the middle ages. I was quite excited to see Mafalda chilling in a park – I have a similar photo with her from the streets of Buenos Aires. We stopped by to say hello to Woody Allen – the director famously loves Oviedo and even filmed portions of 2008 film Vicky Cristina Barcelona in the northern Spanish city. Apparently people love to steal his glasses – but his newest pair looked securely welded/taped on. I like big butts so I fell in love with the Botero bum statue. I saw so many of his pieces of Colombia and his work always made me smile. Our tour of Oviedo concluded with Manuel showing us his least-favourite store-front window. Clearly – he doesn’t love a sausage party as much as I do. A huge thanks to Manolo, Mari-Luz and Manuel for the hospitality. I had just a taste of Asturias – but it was delicious! Asturias is so beautiful and so different from what people expect of Spain.